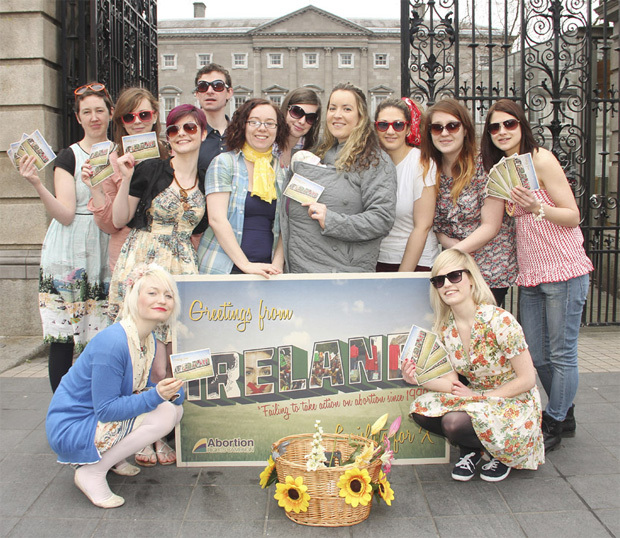 Members of the Abortion Rights Campaign dressed for the summer holidays launch a postcard campaign outside Leinster House, Dublin today (Wednesday 26th February 2013). The postcard campaign is part of 10 Days of Abortion Rights Action, starting on 1st March, calling on the Government to enact X-case legislation as promised and demanding that this happen before the Dáil breaks for summer holidays on 18th July. The Abortion Rights Campaign today launched 10 Days of Abortion Rights Action, which will take place around Ireland from 1st to 10th March. At a press conference in Dublin, the campaign called on the Government to enact X-case legislation as promised and demanded that this happen before the Dáil breaks for summer holidays on the 18th July. As part of the 10 Days of Abortion Rights Action, tens of thousands of postcards will be sent from people in Ireland to their TDs. The postcards will remind Irish politicians that “women’s lives matter” and that the vast majority of the Irish population support the introduction of this legislation. What do we need from legislation on X? It is now 21 years since the X case and several months since the death of Savita Halappanavar. Legislation to protect women’s lives must be in place by summer 2013. 1. We demand a clear timetable for this legislation: every day that goes by is another day that women’s lives are at risk. a. State-wide access to an abortion when a pregnant woman’s life is at risk because of her physical or mental health. b. That a practical assessment can be made by a pregnant woman and her doctor of a “real and substantial risk to the life of the pregnant woman” including suicide. c. That an agreement between the pregnant woman and her GP that there is a threat to her life due to physical or mental health issues is sufficient grounds for abortion. d. A simple, clear and easily accessible appeals process for a woman to take if she disagrees with her doctor’s decision. An appeals process should be speedy and should be available only to the pregnant woman and not to those who conscientiously object to her having an abortion. e. A guarantee that doctors cannot refuse to care for a pregnant woman whose life is in immediate danger. f. The repeal of criminal penalties for having or assisting an unlawful abortion. These penalties can interfere with medical consultations between a woman and her doctor. 3. Provisions for termination when a foetus has a fatal abnormality and cannot survive. 4. A repeal of legislation that prevents women accessing abortion where their health is at risk. Abortion is a health issue, not a criminal issue.